A technique to isolate cholangiocytes from the extrahepatic bile ducts of neonatal mice is described. The ducts are meticulously dissected, and then cells are isolated by outgrowth in thick collagen gels. This method provides a useful tool for studying extrahepatic bile duct development and pathology. Karjoo, S., Wells, R. G. Isolation of Neonatal Extrahepatic Cholangiocytes. J. Vis. Exp. (88), e51621, doi:10.3791/51621 (2014). The intra and extrahepatic bile ducts of the liver are developmentally distinct, and may be differentially affected by certain diseases. However, differences between intra and extrahepatic cholangiocytes, and between neonatal and adult cells, are not well understood. Methods for the isolation of cholangiocytes from intrahepatic bile ducts are well established1-4. Isolation of extrahepatic ductal cells, especially from the neonate, has not yet been described, although this would be of great benefit in understanding the differences between distinct cholangiocyte populations and in studying diseases such as biliary atresia that appear to target the extrahepatic ducts. Described here is an optimized technique to isolate both neonatal and adult mouse extrahepatic bile duct cells. This technique yields a pure cell population with minimal contamination from mesenchymal cells like fibroblasts. This method is based on the removal of the extrahepatic ducts and gallbladder, followed by meticulous dissection and scraping to remove fat and fibroblast layers. 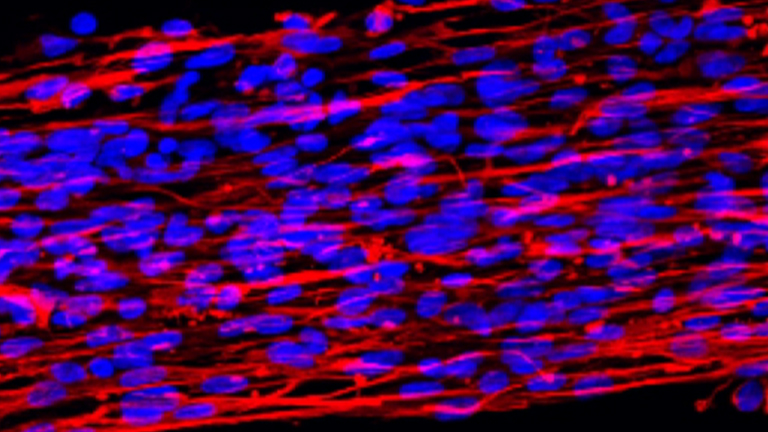 Structures are embedded in thick layers of collagen and cultured for approximately 3 weeks to allow outgrowth of cholangiocytes in monolayers, which can then be trypsinized and re plated for experimental use. The origin and development of intra and extrahepatic cholangiocytes are markedly different. The liver develops from a diverticulum of the ventral foregut endoderm5. The caudal region of the diverticulum forms the extrahepatic biliary tree, while the cranial region generates the intrahepatic biliary tree5. Intrahepatic duct cholangiocytes are derived from progenitor cells around the ductal plate in the peri portal regions6. These cells have the ability to differentiate into either hepatocytes or cholangiocytes6. This has significant clinical implications given that cholangiopathies may specifically target one category of cholangiocytes. For example, biliary atresia initially affects the extrahepatic ducts of the neonate, while Alagille Syndrome affects intrahepatic ducts. There are multiple descriptions of the isolation of intrahepatic cholangiocytes and bile duct units from mice and rats. Investigators have isolated single cells by duct isolation and subsequent outgrowth, or by liver digestion and antibody pull down of cholangiocytes expressing specific cell surface markers1-4. Functional and polarized bile duct units have been isolated by liver digestion and size filtration7. Bile duct units are capable of responding to secretory stimuli and demonstrate fluid secretion7, while isolated cholangiocytes have been shown to develop ductular structures in vitro1,2. Limitations of these methods include the need for specialized technical expertise and special equipment for liver perfusion with digestive enzymes. In addition, there is a risk of contamination with mesenchymal cells3. A method to isolate extrahepatic bile duct cholangiocytes, specifically from neonatal extrahepatic bile ducts, has not been previously described. This paper outlines a simplified technique to isolate neonatal as well as adult extrahepatic bile duct cells at high levels of purity. This technique will facilitate the study of differences between intra and extrahepatic cholangiocytes and research into mechanisms of diseases like biliary atresia that involve the extrahepatic ducts. The entire procedure is carried out at room temperature unless otherwise specified. All animal work should be carried out under humane conditions under a protocol approved by the local Institutional Animal Care and Use Committee (IACUC). Set up the mouse surgical table in close proximity to the tissue culture hood and incubator (Figure 1A). Note: Required equipment includes a dissecting microscope, a light source, 12.5 cm long straight iris scissors, 6 inch non serrated curved forceps with fine tips, and 4 inch serrated forceps with curved tips (Figure 1B). Place sterilized instruments in a glass beaker of 70% alcohol on the surgical table. Fill three sterile 60 mm Petri dishes with sterile isolation media (Table 1); place two on surgical table and one in hood, all on ice. Place rat tail collagen, sterile 10x phosphate buffered saline (PBS), sterile water, sterile 1 N NaOH and biliary epithelial cell (BEC) media (Table 1) in the tissue culture hood. Note: The collagen should be on ice. 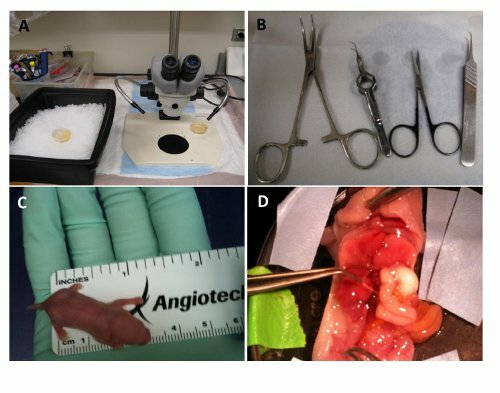 Euthanize neonatal mice between 0-3 days of life, by exposure to carbon dioxide until unconscious followed by cervical dislocation, per IACUC guidelines (Figure 1C). Note: older mice can be used depending on specific experimental needs. Place animal in the supine position and make a small horizontal incision crossing the midline in the region of the pelvis. Extend this incision laterally and up both sides of the abdomen, forming a U shaped flap. Turn flap up to expose the abdominal organs. Once the abdomen is open, carefully move the intestines out of the abdominal cavity towards the right side of the animal for better visualization of the liver and common bile duct. Note: it may be necessary to extend the lateral incisions into the ribcage to obtain better identification of the liver. Using the dissecting microscope, identify the common bile duct, liver, and intestines. Identify the common bile duct first (Figure 1D), using caution, as the structures are very delicate. With the serrated and non serrated forceps, meticulously clean and pick off the connective tissue including fat surrounding the bile. Use one forceps to hold the duct and the other to clean. Use a similar technique to clean the gallbladder. Place the cleaned ducts and gallbladder into the first dish of isolation media on ice. Gently massage the structures with the non serrated forceps while in the media to further remove connective tissue and remove bile from the gallbladder. Transfer ducts and gallbladder to the second dish of isolation media. After isolation of ducts and gallbladders from 5 animals, transfer the pieces to the third Petri dish, in the hood. Note: If cells are to be isolated from more than 5 animals, do in batches, using fresh solutions for each group of 5 animals. Note: any size dish can be used. A 60 mm culture dish with a final volume of 3 ml collagen for each group of 5 neonates works well. This should be prepared fresh at the time of embedding freshly isolated ducts. Place rat tail collagen, sterile 10x phosphate buffered saline (10x PBS), sterile dH2O, and sterile 1 N NaOH on ice. Calculate the volumes of dH20, 10x PBS, NaOH, and collagen required for gels with a final concentration of 2 mg/ml collagen in 1x PBS, using a volume of 1 N NaOH equal to 0.023 times the volume of collagen added. Note: If alternate source of collagen is used, follow the manufacturer's instructions for neutralization and gel formation. Mix together dH20, 10x PBS, and 1 N NaOH, then add collagen and pipette well to ensure even mixing. Once collagen solution has thickened to a gel like consistency at room temperature, immediately embed the ducts in the collagen. Place in the incubator at 37 °C, 5% CO2 for 30 min to enable the collagen to solidify. Once gel has solidified (color changes from clear to white), overlay with 3.5 ml of BEC media (Table 1) and incubate at 37 °C, 5% CO2. Remove BEC media 3 times per week and replace with 3.5 ml fresh media. Note: within 3 weeks, sheets of cholangiocytes (cells with large nuclei extending directly from embedded ducts) will be visible in the thick collagen. If there are large numbers of fibroblasts in the dish, it should be discarded. If a few regions of the dish have fibroblast growth, these can be cut out with a scalpel and removed prior to splitting the cholangiocytes. Dilute collagen to a concentration of 1 mg/ml with sterile PBS. Note: use 1 ml for 100 mm plate; adjust accordingly for other size dishes. Spread the collagen solution evenly with a cell spreader (large dishes) or pipette tip (small dishes), then leave at room temperature for 10 min. Cover plate with DMEM/F12 and incubate at 37 °C, 5% CO2 for 10 min. Remove plate from incubator and wash with 1x PBS. Immediately aspirate the 1x PBS. Coat with a second thin layer of collagen, spreading by rotating the plate or placing plate on a shaker. Incubate at 37 °C, 5% CO2 for 10 min. After collagen has solidified, cover plate with DMEM/F12 and incubate at 37 °C, 5% CO2 for 30 min. With cell culture spatula or cell scraper, scrape collagen gel gently off the plate so that it is floating. Prepare collagenase solution by diluting Type XI collagenase (see materials list) to 10 mg/ml with DMEM/F12. Mix well and sterile filter. Add 1 ml of collagenase solution (above) per 60 mm dish of cells in thick collagen. Do not remove the BEC media (which should be 3 ml). Incubate dish for 30 min at 37 °C, 5% CO2. Remove solution containing cells, and place in 15 ml conical tube. Spin down at 2,200 x g for 5 min. Discard the supernatant and re suspend pellet in similar volume of DMEM/F12. Spin solution again at 2,200 x g for 5 min. Remove supernatant. Resuspend pellet in 3 ml of 0.5% trypsin, and incubate at 37 °C, 5% CO2 for 5 min. After incubation, pipette the solution up and down to break up the sheets of cholangiocytes. Add 5 ml of BEC media and spin solution at 1,500 x g for 5 min. Remove supernatant, and resuspend pellet in DMEM/F12, then spin solution at 1,500 x g for 5 min. Remove supernatant and re suspend pellet in BEC media (Table 1). Plate cells on previously made thin collagen gels. Note: cells on thin collagen gels can be split as needed. Wash plates with sterile PBS prior to incubating in 0.25% trypsin at 37 °C for 10-15 min. Neutralize with an equal volume of BEC media, and pellet at 1,500 x g for 5 min. Rinse pellet with DMEM/F12, then pellet at 1,500 x g for 5 min. Resuspend cells in BEC media for distribution to collagen coated cell culture dishes. Note: Alternatively, cells can be resuspended in storage media and stored in a -80 °C freezer or liquid nitrogen (Table 1). The use of this protocol results in the isolation of a population of neonatal mouse extrahepatic cholangiocytes with excellent purity, as demonstrated by K19 immunofluorescence staining (Figures 2A and 2B); we achieve similar results isolating cells from adult mice. We have observed that it takes 3 weeks for cells from freshly isolated bile ducts to form monolayers on thick collagen gels. The cholangiocytes grow in a linear fashion throughout the thick collagen, forming sheets of cells from the isolated ducts. Cells should be split and re-plated on thin collagen gels before monolayers become overgrown, since holes appear in the sheets of cells if cultures are not split before 3 weeks. For optimal cell growth and to minimize fibroblast contamination, it is important to remove the connective tissue surrounding the delicate extrahepatic ducts carefully and meticulously during the dissection and cleaning steps (2.3, 2.4). If there is growth of fibroblasts, removal of the affected area of thick collagen with a scalpel or gentle suctioning can reduce the transfer of fibroblasts prior to splitting cells. These cells divide rapidly during the first three passages but at higher passage points, the growth rate slows, and the cells become larger and vacuolated. We have successfully frozen samples of cholangiocytes, and re-plated them at later times with excellent viability; thawed cholangiocytes, however, do not replicate as fast as freshly isolated and split cells. Figure 1. Surgical equipment should be set up in proximity to tissue culture apparatus. (A) Light source is placed behind the dissecting microscope. (B) Surgical equipment includes sharp scissors, hemostat, a curved serrated tweezers, and a curved un-serrated tweezers. (C); Size of a 3 day old mouse used for isolations . (D) Tweezers are holding the common bile duct in the neonatal mouse. Figure 2. Pure populations of extrahepatic cholangiocytes are isolated with minimal contamination with mesenchymal cells. Cholangiocytes were stained with K19 (green) with DAPI nuclear imaging (blue). Scale bars, 25 µm. *Ingredients need to be prepared to appropriate concentrations before adding into media. Refer to material list for further instruction. **After ingredients are mixed, sterile filter media and aliquot. Media can be frozen up to 6 months in - 20˚C. Described here is a technique to isolate pure cholangiocytes from the extrahepatic bile ducts of mice of mice of all ages, including neonates. The technique offers the advantage that extrahepatic cholangiocytes can be studied separately from intrahepatic cholangiocytes, and may facilitate studies to identify key differences between these populations of cells. We recently published a study demonstrating decreased cilia in extrahepatic cholangiocytes isolated by this method and infected with rhesus rotavirus8. Disadvantages include that the technique is labor intensive, and meticulous dissection is required to prevent fibroblast contamination; additionally, outgrowth and at least 3 weeks in culture are required to obtain sufficient cells for most experiments. Thus, these cells may reflect changes associated with two dimensional culture. It has not yet been determined whether the cell populations obtained include significant numbers of stem cells or cells from peribiliary glands9,10. We attempted to use this method to isolate extrahepatic cholangiocytes from rats; however, cells failed to grow in culture. Whether a key growth factor is missing in the culture media or whether other conditions need to be altered is currently under investigation. Ultimately, this method to isolate extrahepatic cholangiocytes may contribute to understanding differences in intra and extrahepatic forms of biliary fibrosis, as well as differences between neonatal and adult cells. The authors are grateful to the Molecular Pathology and Imaging Core of the UPenn NIDDK Center for Molecular Studies in Digestive and Liver Diseases (P30 DK50306) for assistance with imaging. This work was supported by grants from the National Institutes of Health (R01 DK-092111) and from the Fred and Suzanne Biesecker Pediatric Liver Center (to R.G.W.) and by a fellowship from the Childhood Liver Disease Research and Education Network (to S.K.). Paradis, K., Sharp, H. L. In vitro duct-like structure formation after isolation of bile ductular cells from a murine model. J. Lab. Clin. Med. 113, (6), 689-694 (1989). Vroman, B., LaRusso, N. F. Development and characterization of polarized primary cultures of rat intrahepatic bile duct epithelial cells. Lab. Invest. 74, (1), 303-313 (1996). Kumar, U., Jordan, T. W. Isolation and culture of biliary epithelial cells from the biliary tract fraction of normal rats. Liver. 6, (6), 369-378 (1986). Ishii, M., Vromen, B., LaRusso, N. F. Isolation and morphologic characterization of bile duct epithelial cells from normal rat liver. Gastroenterology. 97, (5), 1236-1247 (1989). Strazzabosco, M., Fabris, L. Development of the bile ducts: Essentials for the clinical hepatologist. J. Hepatol. 56, (5), 1159-1170 (2012). Carpentier, R., et al. Embryonic ductal plate cells give rise to cholangiocytes, periportal hepatocytes, and adult liver progenitor cells. Gastroenterology. 141, (4), 1432-1438 (2011). Cho, W. K., Mennon, A., Boyer, J. L. Isolation of functional polarized bile duct units from mouse liver. Am. J. Physiol. Gastrointest. Liver Physiol. 280, (2), (2001). Karjoo, S., Hand, N. J., Loarca, L., Russo, P. A., Friedman, J. R., Wells, R. G. Extra-hepatic cholangiocyte cilia are abnormal in biliary atresia. J. Pediatr. Gastroenterol. Nutr. 57, (1), 96-101 (2013). Sutton, M. E., op den Dries, S., Koster, M. H., Lisman, T., Gouw, A. S., Porte, R. J. Regeneration of human extrahepatic biliary epithelium: the peribiliary glands as progenitor cell compartment. Liver Int. 32, (4), 554-559 (2012). Cardinale, V., et al. Multipotent stem/progenitor cells in human biliary tree give rise to hepatocytes, cholangiocytes, and pancreatic islets. Hepatology. 54, (6), 2159-2172 (2011).